Anyone that has even the remotest inkling about the historical family tree of U.S. doom are well familiar with the name ASYLUM. Formed in 1981, by founding guitarist / vocalist Dale Flood and his band mates Earl Schreyer (bass) and Ron Kalimon (drums), ASYLUM – which eventually became UNORTHODOX – would over time become one of the pivotal acts in spearheading the now globally revered Maryland Doom movement. Together, this power trio issued a string of demos during the mid-Eighties, mostly with matter-of-fact titles like ‘Demo 1985‘, ‘Demo 10-10-86‘, or ‘Demo 1987‘. There was also 1985’s six-song ‘The Earth Is The Insane Asylum Of The Universe‘, which has reached a legendary cult status with well-informed rock aficionados. Yet, before there was ASYLUM, there was Obstination, the band first named and formed by Flood and his friends while still in high school, which years later they would return to for a period of time. During the second round of using the Obstination name, the band released a self-titled, full-length for Peace Records in 1991, and were included on a four-way split release from Doom Records in 1994. The ‘Double Dose Of Doom‘ compilation spotlighted some of the Maryland scene’s best active bands at that time. Joining Obstination on it were Rat Salad, Force, and… ASYLUM. RIFF RELEVANT [Pat]: Dale, what things led to the birth of Asylum at that time? If there had to be a so-called Mission Statement for the band, what would it be, or have been? DALE FLOOD: Our first band name was Obstination, an idea for a name that was suggested from a friend of ours, Lowell Ginsburg. The first song I ever wrote, along with Ronnie Kalimon and Earl Schreyer, was titled “Obstination“. Eventually, Asylum came together out of Obstination, with the same three friends since our early High School years, and we all possessed a genuine passion for music. We started out practicing / playing songs from bands like Rush, Black Sabbath, Jimi Hendrix, Cream, and Motörhead One of our first shows was a battle of the bands at our high school in front of pretty much the entire student body, we were very excited and nervous but we played great and the crowd loved it!! The cheers were big and loud! Back in those days, local bands only played cover songs, that’s how you got gigs, but we started writing our own songs. So playing out was not very easy for us, yet at the same time, we were cherished by Wino and The Obsessed, along with Bobby Liebling and Pentagram, because we played our own songs. As for our mission statement, it was “Don’t be afraid to play original music!” I remember Wino would be onstage and say, “If you wanna hear other people’s music then go home and play your radio!” A creed I have lived and live by. 1992 saw yet another name change, and new blood joining Dale, in the now revered act UNORTHODOX. 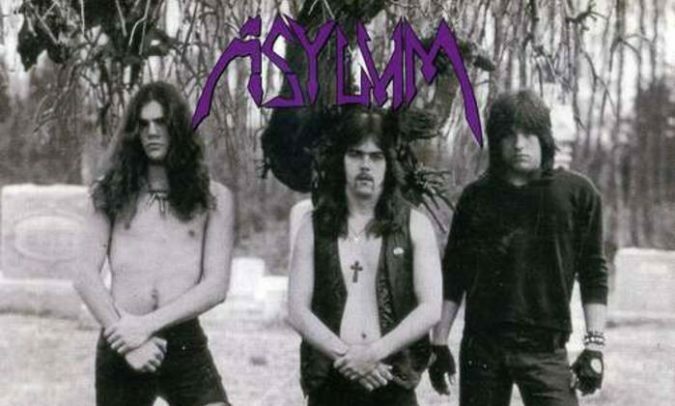 Their début album for Hellhound Records that same year was titled, appropriately enough, ‘Asylum‘. It served as the studio based launching point for the band and Dale’s ongoing musical evolution, one that has achieved much recognition in the years since. UNORTHODOX would release two more studio full-lengths, ‘Balance Of Power‘ (1994) and ‘Awaken‘ (2008), as well as two live video releases, ‘Unseen World‘ (2007) and ‘Live At Krug’s Place‘ (2010). A plethora of inspiring musicians would come and go throughout the years including Gary Isom, Jeff Parsons, Mark Laue, and Jon Blank (R.I.P. ), among others. UNORTHODOX has been active in recent years, playing live regularly, including a performance at this year’s Maryland Doom Fest 2018. However, some uncertainty has recently arisen concerning the band, something I inquired of with Dale, if he would like to address anything. RIFF RELEVANT [Pat]: How are things going with UNORTHODOX currently? Can we anticipate some new music from you all at some point? DALE FLOOD: The most recent line up most had been with two amazingly talented players. Blake Dellinger and I had been working very hard together for 3 years, and we were very lucky to have Alan Pfeifer with us the last year and a half. I have to say these two young bloods are, to me, the entire package. A wise man once said that the true test of finding the right people in your life is “are they ready, willing and able? !” Blake and Alan were all three and that is very hard to find, something I have learned in my 40 years of playing in bands. Now, let us return back to the beginning – ASYLUM – as some incredible news has surfaced from Shadow Kingdom Records. The label recently released a special “lost” recording from the band. On September 28th, a Holy Grail-like item of cult collected recordings, ‘3-3-88‘, became available on a physical format (CD) for the very first time! Long circulated in MP3 form by die-hard collectors within the heavy music underground, ‘3-3-88‘ was indeed recorded on March 3rd, 1988, and was the last-known recording under the ASYLUM moniker. Its ten songs provide an aural snapshot of a moment in time that has become a point of mass inspiration for untold numbers of musicians and fans. RIFF RELEVANT [Pat]: Dale, what are your feelings about the release of ‘3-3-88‘? What do you hope that music fanatics are able to take away from its official release now, 30 years after the original recording? DALE FLOOD: My feelings about the Asylum ‘3-3-88’ album are it took 30 years to finally get released! I can’t begin to express my gratitude to Tim McGrogan and Shadow Kingdom Records, to invest in a record of ours that has no tour support for one thing. But I know that every note on the recording is genuine, it’s a record that truly captures the energy that Asylum possessed. It’s sonic and hypnotic, and for me, it has passed the true test of time… 30 years is many a mile! RIFF RELEVANT [Pat]: I know ASYLUM are hugely revered by doom metal fans and all, but I pick up a lot of vibes from the music that are clearly outside of the usual doom parameters. Would you agree with this and (yes or no) care to elaborate further? DALE FLOOD: We never really considered ourselves a “Doom Metal” band, we always considered ourselves a “Heavy Hypnotic Progressive Metal” band but know that I love Doom Metal and we embrace the “Doom Metal” tag! I can’t thank Michael Bohl and Tom Reece of Hellhound Records enough for signing us back then. If not for them, I have no idea where I would be now. I’m forever proud of our records to this very day. RIFF RELEVANT [Pat]: How do you feel about the attention that the Maryland Doom scene garners now? And your part in it? DALE FLOOD: The Maryland Doom Metal scene today is very much appreciated, and thanks to JB Matson, along with his die-hard staff, for hosting the Maryland Doom Festival. It remains very relevant, and I wouldn’t change a thing. Maryland is forever my home “town”. RIFF RELEVANT [Pat]: Anything you would like to add or share with us before we close? DALE FLOOD: All I can add is I really appreciate your time to interview me here in Nashville, Tennessee, Patrick and your interest in our music! Thanks, brother and Peace! Thank you, Dale! With that, we wind down this special edition of Oldschool Sunday, one that I felt would be lacking if we did not hear from the man behind the bands Asylum, Obstination, and Unorthodox, as well as my friend and brother, Dale Flood. Stream ‘3-3-88‘ below and capture the feeling of an incredibly significant musical period in time, one that has evolved and grown through the years to become a specific scene and legendary sound: Maryland Doom!